After a one month break, the second half of the UCI Mountain Bike World Cup presented by Shimano begins in Champéry, Switzerland, with a double event - cross-country and downhill. This Alpine village will play host to the world championships next year so, in addition to wanting to perform well in the World Cup, riders will be anxious to check out the courses for 2011. The action begins on Saturday with the cross-country. The circuit has been slightly modified from the one used last year, with a short steep climb and sharp descent added in the first half of the circuit. The riders still face the long climb that opens the second half of the course, but do not go as high as previously. The rain that has been falling during training has made the new climb and descent quite tricky, according to women's World Cup leader Catharine Pendrel (Luna). "I think it is actually harder than last year. There are two climbs [per lap] now, and the first one is slippery in the wet. The dropoff that follows it has only one line, and if you miss it you are in trouble." Canada's Pendrel, who won the last round in Offenburg, Germany, will be looking to extend her lead in the World Cup standings, but she will face a number of challengers. American Willow Koerber (Subaru-Gary Fisher) is anxious to take back the leader's jersey after a sub-par performance in Offenburg. Other challengers include world champion Irina Kalentieva (Topeak Ergon) and last year's winner at Champéry, Elisabeth Osl (Central Pro). The top six women are separated by only 100 points, so it is quite likely that the winner in Champéry will be the World Cup leader going into the next round. 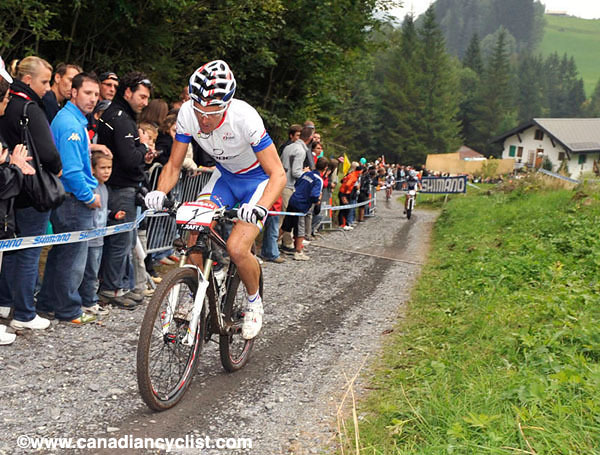 On the men's side, the World Cup is becoming a battle between series leader Julien Absalon (Orbea) and world champion Nino Schurter (Scott-Swisspower) the pair are separated by only 40 points, and if either wins in Champéry they will probably don the leader's jersey. Other podium contenders include Jose Hermida (Multivan Merida) and newly crowned European champion Jaroslav Kulhavy (Rubena Birell Specialized). The downhill course is returning to the World Cup for the first time since 2007. It has already become renown as the steepest course on the international circuit, with sections approaching a 75% grade. Organizers have named it "Dérup", which means 'little steep path'. Despite the steepness, it is technical enough to slow the riders down and a clean run is hard to achieve. Sabrina Jonnier (Maxxis-Rocky Mountain) leads the women's series by a healthy 140 points over Floriane Pugin (Scott 11). Rachel Atherton (Commencal), the winner of round one in Fort William, Scotland, would usually be expected to battle neck and neck with Jonnier, but the British rider is out of action for the rest of the World Cup season after a crash in the third round at Leogang, Austria, where she re-injured the shoulder that ended her season last year. In the men's series, Greg Minnaar (Santa Cruz) holds a 73 point lead over Gee Atherton (Commencal), with third placed rider Aaron Gwin (Yeti Fox Shox) 250 points behind and out of contention for the World Cup lead. Perennial favourite Sam Hill (Monster Energy Specialized), is out for most of the season with a shoulder injury suffered in round two. The action begins on Friday with downhill qualifying, followed by the finals on Saturday, before concluding on Sunday with the cross country.